Why is the kitchen the most important room in the home? And why so many people are devoted to finding unique kitchen décor ideas and unique kitchen accessories? The kitchen is not only a place where cooking and having meals is happening. There is so much more behind just preparing and enjoying the food. From gathering and entertaining guests to getting together as a family, the kitchen is the soul and the heart of every home. The importance of this room seems to rely on few factors. How big is your family? What is your lifestyle? What is the size of the kitchen? Many older homes have kitchens separated from the rest of the home and were somewhat smaller. The kitchen space was solely for cooking only and keeping the mess away. In other homes, this room is large enough to have a table inside where the whole family can have breakfast or light meal with more important meals still being served in the dining room. The last two decades kitchen started to become living spaces, where more was done than just cooking. 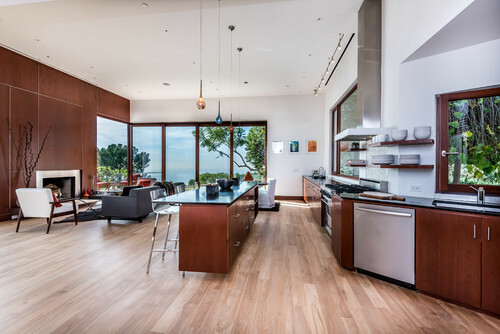 Various new homes are designed in a way that kitchens are living areas. Larger rooms with space not only for cooking but entertaining guests and enjoying homemade meals is the trend for the contemporary modern kitchens. Those newer and larger rooms are more accommodating having enough space for dining tables and kitchen islands. The design is much more open and functional following the trend of kitchens converting to a living area fitting the way of living of the homeowners. The lifestyle of the family influence the importance of this room very much. Some enjoy cooking and having guests over and still have a family tradition to have their meals together. They spend a lot of time in the kitchen and prefer to have great kitchen design, functionality, and fill this room with stylish décor and attractive accessories. The love of entertaining guests and creating a cozy environment for the family impose the need for transforming this area into everyone’s favorite room in the house. Some lean towards this principle others not so much. What is your thought on this? Small or large, I believe the kitchen is the core room of a home. The reflection of everyone’s lifestyle is paying a grand contribution to how the kitchen space matter, how is being used and why does someone need to have it well designed, efficient and functional. Unique Kitchen Decor and Accessories at Glance! 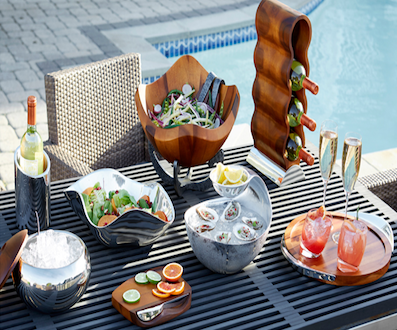 Today I would like to share with you the award-winning designs and a superior quality of the brand’s collection of serverware, home décor and barware of Nambé. For more than 60 years of Nambé, work together with the world’s most appreciated designers to evolve stylish products that create function and elegance into every home. Nambé pieces are exhibited in prominent galleries around the world – from The British Museum in London to the Museum of Modern Art in New York. Their collections for sure bring unique kitchen décor ideas for every home. 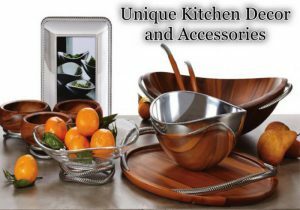 Nambé’s unique kitchen accessories would guarantee that you are surrounded with style and elegance. For many people, Nambé fits their lifestyle and vision of unique. If you prefer high-quality, sophisticated and unique kitchen accessories, and your budget allows it, you will enjoy Nambé! Take a look for yourself some wonderfully arranged tables with Nambé accessories. 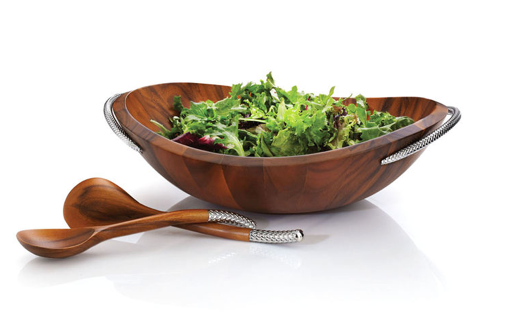 This impressive wood grain Braid Salad Bowl w/Servers has the beautiful natural shine of chrome handles which is also applied at the end of the serving spoons. Lavishly sized to enjoy at your dinner parties. Designer Sean O’Hara. 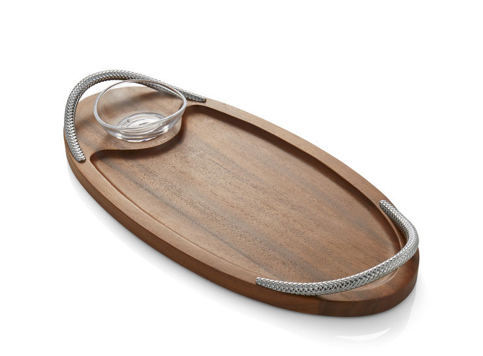 Hosting events with this Bread Board with Dipping Bowl are limitless. From dipping herbed oils, hummus, tapenades, and delicious spreads to roasted veggies. Perfect for slicing and serving. The braided handle design radiated in contrast with the rich wood base of the board. Truly a timeless piece! Designer Sean O’Hara. Another great addition to Sean O’Hara’s collection! 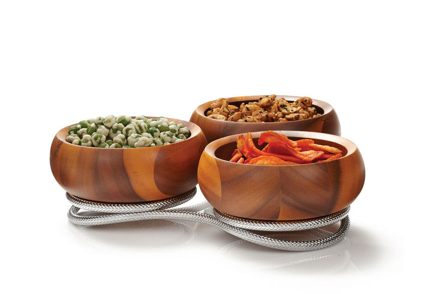 The elegant braided detail designed in series of spirals forms a base of three beautiful wood bowls. Excellent way to keep your table beautifuly arranged! Unique kitchen accessory – both functional and stunning! Abundantly sized to hold piles of tasty tortillas or pita chips. 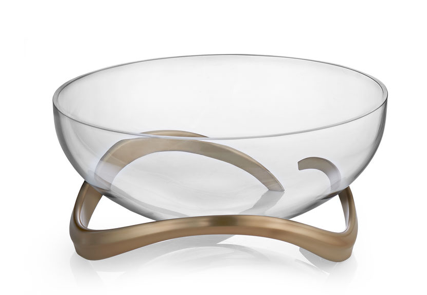 Crafted with Nambé Alloy the dip bowl can be removed for chilling or warming. Designer Wei Young. 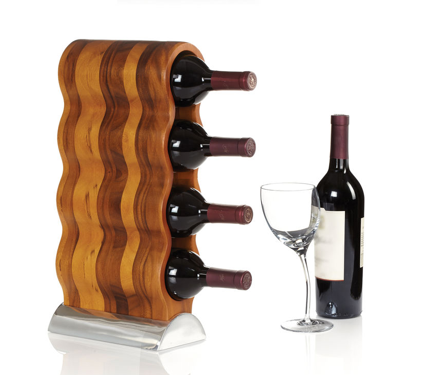 This wine rack is a lovely and practical art piece from acacia wood and rests on Nambé Alloy base. The balanced curves form spaces for four bottles of wine. Designer Steve Cozzolino. The Tulip Tool Jug w/Tools is unique set that resembles a flower vase. It is a wonderful addition to your counter top and includes five wooden tools. Designer Steve Cozzolino. A charming centerpiece display features a generously sized glass bowl resting on sophisticated champagne satin finish base. Can be used as a decor piece on its own or filled with flowers, fruits, salad or pasta dish. Designer Neil Cohen. Another functional and yet an art piece! What can I say? Simply beautiful and elegant! 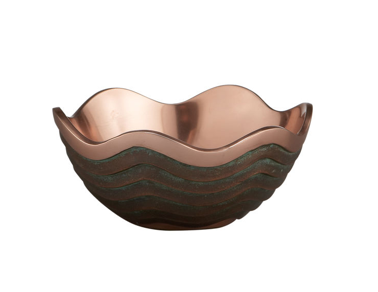 The wave-like warm copper top slopes down to the bowl’s flat bottom. Unique design for unlimited ways of using this one-of-a-kind bowl. Designer Lisa Smith. 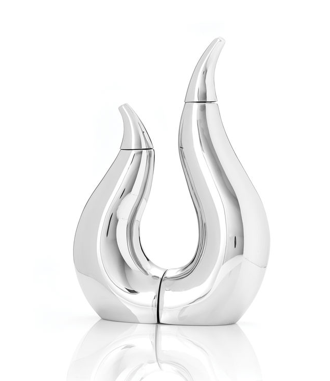 With the bold and modern art shapes, the Duet Oil and Vinegar are the ultimate functional sculpture. Each side is freestanding for easy passing and pouring with the perfect shapes that fit into the hand. Designer Neil Cohen. 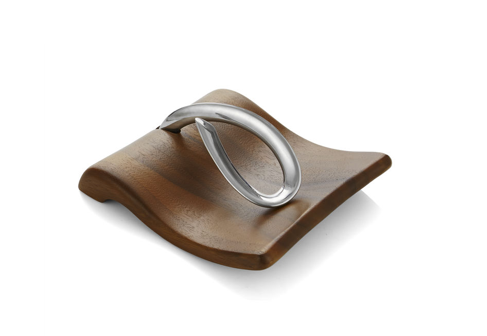 The Breeze Napkin Holder features a movable arm that lifts to secure napkins whether indoors or out. 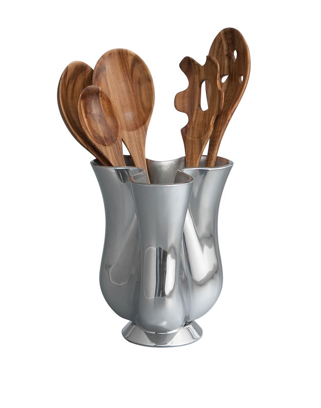 The rich acacia wood base makes this holder a great addition to your unique kitchen accessories. Designer Neil Cohen. These stunning and unique kitchen accessories or you can easily classify them as unique kitchen decor as well are truly exceptional! I love how functionality and elegance blend to deliver those unique art kitchen pieces that for sure will please not only you but your guests and family as well. Create a timeless beauty and functionality in your home. 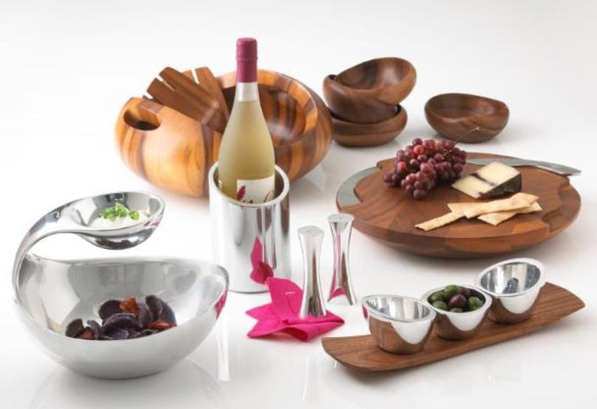 The presented products were just an illustration on how you can bring uniqueness in your kitchen or give a special gift to someone who loves bold, different and original. Of course, they are countless ways on imagining your unique kitchen decor ideas and having those unique kitchen accessories if you are into the creative approach of seeing and experiencing things in life. Your lifestyle and personality is the key of how important are certain ideas and the level of determination for achieving it. I would love to hear your opinions on what is the most important room in your home and why? I love decorating and I love a nice clean kitchen. 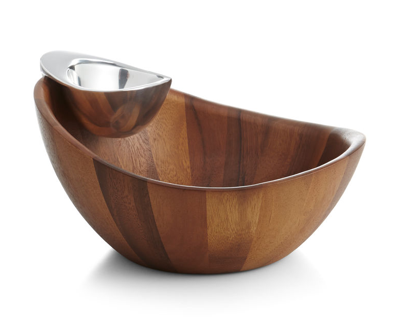 That salad bowl looks great, and I really want it, but the oil and vinegar duo is amazing. I love how they look and right away I pictured them in my kitchen by my kitchen aid mixer. 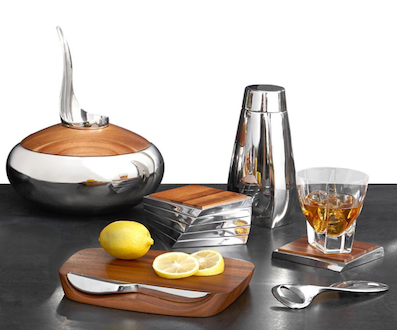 Do you have any recommendations for a father’s day gift for the kitchen? Hi, Steve and thank you for stopping by and commenting! I am happy you love the products I shared on my post. I am planning on having another post for Father’s day and I will make sure I will include a kitchen gift for Dad! So come back later to check it out! 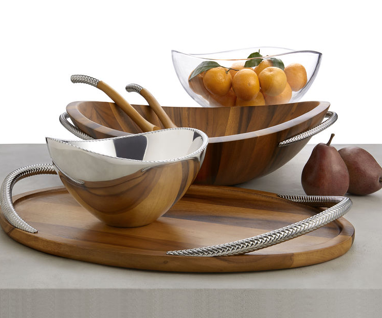 I love how these pieces combine modern style with natural elements and simplicity. They are so beautiful and clean looking! I especially love the Harmony Chip and Dip bowl. It looks stunning. I had never heard of Nambe before, but I’m glad you put together this post to highlight their products. Hi, Kiersten and thank you for your comment! I agree with you that the modern style with natural elements and simplicity does make those products stunning! I am glad you found them! Thanks for this “unique” post. Since of lately my wife is getting more and more into these unique kitchen ware. I must admit though that it appeals to my taste also, but a little on the expensive side. I like also how you mention that the kitchen is not just a place where you eat. For us, it is truly one of the most important places in the entire house. Hi, Chris and thank you for your comments! I agree that those kitchen accessories are bit expensive but you don’t need to buy them all at once and once bought you don’t need to change them every year. I love the saying ”You get what you paid for” You get something for the kitchen that it is cheap, well that is exactly what you will get in terms of quality and design too. I am not saying you can’t have unique and original kitchen accessories for less. It all depends on one’s lifestyle and taste! I see that you have quite a great taste with your selection of decor ideas and accessories. They certainly are unique. I personally like the Duet Oil and Vinegar and the Centerpiece Bowl, since I mostly prefer glasses, crystals, and steels. I hope to see more of your unique ideas and recommendations. Hi, Rocky and thank you very much for your comment! I am glad you enjoyed my recommendations. Those pieces are truly unique and I wanted more people to find out about them!